iPhone Games – Tiny Wings and Bejeweled Blitz – Planet Geek! Popcap is by no means a newcomer to the gaming arena, with some pretty awesome titles under it’s belt. And Bejeweled has been around since dinosaurs roamed the earth. The current twist though is the ‘Blitz’ aspect. In a nutshell – it’s a single fast paced game. One minute, beginning to end, get the best score you can. GO! Fun? Sure, but add in the bit about comparing your scores with your friends on Facebook (without having to spam their news feeds)? Now it’s addicting as hell. The scores reset every week, so once you’re on top score-wise, you’ll have to fight again next week to regain your spot. I am but a small fry in the great Bejeweled Combat arena, topping out my high score somewhere just south of 400,000. I have friends on my list that have gotten upwards of 700,000, but I consider them mutated beings from planet zorax. * The “One minute… Go…” at the beginning is not a count down timer. As soon as the board comes up, you can start making matches. You get an extra 4 seconds or so before the timer starts. Use them! * ALWAYS use the doubler booster. With just this power up, you can run with a minimal amount of coins for quite a while, as a decent series of 4 games will replenesh 80% of the coins used. * When using the doubler booster, shoot for that FIRST. Once you get the doubles, you can start playing with other specialized gems, but don’t get fancy until you have at least the 2x counter set. * Use the ‘daily spin’ to get new coins every day at Facebook. Free coinage! * RELAX. I’ve found the ‘zen mode’ of playing this game works best. * Interlace moves. 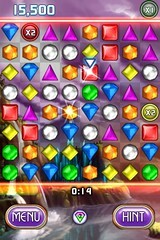 The game goes bananas in bonuses when you overlap moves – have a combo going on on the right side of the board? As gems drop, make matches on the left side as well. The game will start tossing better and better special gems at you. I hope that Popcap will continue this tradition of offering coins for bonuses. I’ve been playing Zuma Blitz a little bit, and found it less ‘friendly’ toward coin rewards. Also, there’s no iPhone version. Fail! 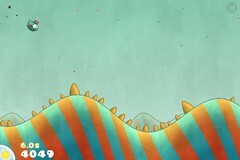 I found this one due to my son picking it up off the app store. It’s $0.99, and is pure, unadulterated goofy fun. The premise is you’re a tiny bird (which seems to have taken it’s physical appearance from the ubiquitous tennisball shaped Angry Birds birds), who has, well, tiny wings. Alas, the tiny wings can’t keep you in the are without some help, so you have to ‘slide’ down hills and slingshot back up in the sky. There’s only one control – touching the screen – and that causes the bird to fold his wings and you fall more rapidly. Let go, and you start flapping again. The gameplay is in the timing. You want to land on the downslope of the hill, and release just at the bottom to get as much altitude off the hill as possible. Bonuses are awarded for ‘touching the clouds’, longest distance travelled, most ‘swoops’ in a row (a clean slide down and launch a hill), and most little stars collected. Simple, huh? Well, most well designed games are SUPPOSED to be simple. A typical Tiny Wings game lasts about 4 minutes, is playable right through to the end, and is limited purely on time and distance flown. You can only fly during the ‘daylight’, so when that runs out, you go to sleep. However, you’re flying due west (I guess), so if you’re moving fast enough, you can keep ahead of the sunset. Play well, the game goes on for a while. So far my best score is somewhere in the mid 70,000’s. I also just read that Tiny Wings has dethroned Angry Birds from the top slot in the app store. Have to admit that’s just fine by me – I was never a fan of Angry Birds.